Many of you will think of an air gun as anything that fires a projectile from a smooth-bore or rifled barrel using the power of air. This is the standard definition that can be found across the internet. But air guns are so much more than that today, as some use compressed air, others CO2 gas, and some a spring and piston, which still all come under the umbrella of air guns. As a rule of thumb, the term air gun is generally used to refer to any type of gun that uses compressed gas as the propellant, as opposed to burning powder, as in rifles and shotguns. And you should always consider the right air gun pellet for your needs as well. Probably one of the oldest air gun mechanisms to still be around today is the spring-and-piston type, with the first examples of their existence going back to the late 1800s. The principle of a spring-powered air rifle is that a spring is cocked by means of a lever; it’s often the barrel that doubles for this job, but some guns are a side- or underlever type, which allows the barrel to be fixed in place. This lever then compresses the spring, which has a piston in front of it, with a washer on the front. This washer used to be made from leather, but today they tend to be made from plastic. This washer creates a near air-tight seal, so that when the spring’s tension is released, the piston compresses the air in front of it, which is then forced through a port into the barrel, propelling the projectile forward. The Stinger Starter UL Tactical Kit is a great spring rifle for target shooting and plinking. As this mechanism has very few moving parts, it’s probably the most reliable type of air gun, especially as so many models from nearly 100 years ago are still working flawlessly today! One slight downside of this system is that the spring wears over time, causing power loss, but a gunsmith can easily replace the spring to get the power back up to where it should be. Spring air rifles come in a wide range of prices from choices such as the Stinger UL Tactical Starter Kit .22, right up to the top-of-the-range, state-of-the-art Air Arms Pro-Sport Walnut Stock .177, which offers some of the best accuracy and consistency straight out of the box. 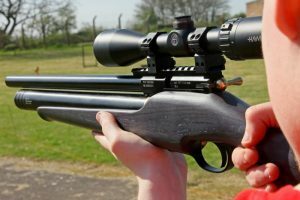 An upgrade on the standard spring airgun is the gas ram system, which is very similar in its principles to a spring air rifle, except the spring is replaced with a gas strut. For those of you who can’t picture a gas strut, it’s basically a larger version of what holds a car boot open. The gas strut doesn’t suffer the same downfalls as a spring does, such as spring fatigue, meaning that the power stays the same for longer. The gas strut also offers better shot-to-shot consistency, as the compression of the gas is more consistent and accurate than that of a spring would be. Again, prices vary in the gas ram range, from the e Webley VMX D-Ram .22 – Black Synthetic, right up to the Weihrauch HW90K .177. The next step up from spring and gas ram air rifles are CO2-powered rifles, which use either the small 12g capsules, or the larger 88g cylinders. Both are filled with compressed CO2, and once loaded into the rifle, the gas flows through a valve, eventually being released into the barrel to propel the pellet when the trigger is pulled and the hammer strikes the valve. This system is completely recoil-less, so it’s a lot easier to get better accuracy with one of these rifles straight out of the box. CO2 does have its disadvantages though, as it’s very dependent on temperature, so it’ll be a bit more powerful on a warm day, but less powerful on a cold day. Spring and gas ram don’t experience this fluctuation by comparison. CO2 are a lot quieter though, as they don’t have much internal movement going on, so with a suppressor fitted, they are close to silent. Choices start from the Rat Sniper .22 CO2 Air Rifle, which is a great rifle for those looking for a bit of target shooting and light pest control, up to the all-bells-and-whistles Umarex 850 Air Magnum XT .22 Deluxe Kit, which offers multi-shot, full-power shooting. PCP (pre-charged pneumatic) rifles are the next step up from CO2 and offer the best in accuracy and consistency out of all the airgun types currently on the market. PCP rifles use high pressure air – some running at pressures of up to 300 BAR – to propel the pellets along the barrel. The advantage of high-pressure air is that it doesn’t change power as the temperature varies, and is also a lot more stable than CO2, giving much better results when firing pellets. The principle is similar to the workings of a CO2 gun, with the air held in a reservoir, which is recharged via a diving cylinder or a stirrup pump. This air is then released into the barrel via a valve, which is struck by a hammer when the trigger is pulled. PCP rifles are available in all shapes and sizes, with both single-shot and multi-shot actions available. Some good starting points would be the Zbroia Hortitsia .22 – Black or the Daystate Griffin .177, with prices varying anywhere in between, depending on your budget! An airgun is not just a gun that uses air to fire pellets. It’s much more than that today, with some top-end rifles even utilizing electronic actions to fire the pellets! There are still many new advances to come, but I hope this blog post has helped explain some of the different types.